Sugar Free Recipes â€“ The Ultimate Low Carb, No Sugar Cookbook! Are you interested in supporting your sugar detox diet with sugar free recipes? Are you desperate to lose weight and get your sugar addiction and sugar cravings under control? Do you want a sugar free cookbook that contains QUICK, EASY and DELICIOUS, low carb, no sugar 30 MINUTE recipes? Speedy and Easy 30 MINUTE Sugar Free Recipes for Breakfast, Lunch, Dinner and Dessert will give you all that! Plus the low carb recipes contained in this book will help lower blood pressure, lower cholesterol, cleanse and detox your body, and help manage diabetes for life. 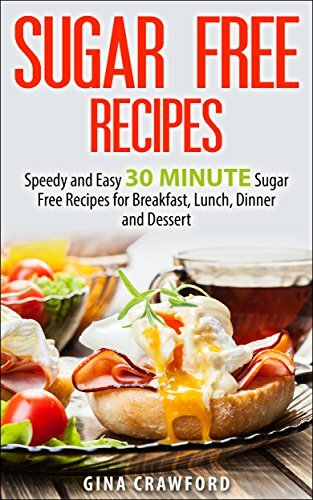 Speedy and Easy 30 MINUTE Sugar Free Recipes is a â€œno sugar dietâ€ low carb cookbook for those that have completed a sugar detox and are now interested in maximizing their sugar detox efforts by maintaining a sugar free diet or low sugar diet. Nutritionist Brooke Alpert & dermatologist Dr. Patricia Ferris recommend following a 4 week eating plan with sugar free recipes AFTER a sugar detox. All the Sugar Free Recipes contained in this book take ONLY 30 MINUTES to prepare! PLUS, NO ARTIFICIAL SWEETENERS are used in any of the recipes! Statistics say that the average American consumes 156 pounds of added sugar each year. Yet, sugar can be extremely damaging to the body because it can cause all kinds of life-threatening diseases. Nutrition experts say that refined sugar is as harmful as a drug. It is simply a pure chemical derived from plant sources that is purer than cocaine. Studies show that sugar actually causes the brain to react in a similar way that it does to opiates like heroin or morphine. It creates a euphoric feeling that makes you consume more sugar to create the same â€˜highâ€™ you had before. This sugar free cookbook is loaded with recipes that support a sugar smart diet. By using the recipes in this book, you will be on an ongoing sugar free diet, sugar cleanse and detox that will keep your body healthy. As an added BONUS, Sugar Free Recipes includes a preview chapter of the book Sugar Detox for Beginners â€“ A Quick Start Guide to Bust Sugar Cravings, Stop Sugar Addiction, Increase Energy and Lose Weight with the Sugar Detox Diet. This book will help you detox your body from the harmful effects of sugar BEFORE starting to eat sugar free.